A self‐running, kiosk‐style PowerPoint presentation is one that plays on its own. You can use your Mac to make it play from a kiosk or simply send it to co‐workers so that they can play it. In a self‐running presentation, slides appear onscreen one after the other, and neither you nor anyone else has to advance the presentation from slide to slide. When the presentation finishes, it starts all over again from Slide 1. Enter how long you want each slide or all the slides to remain onscreen. All slides for the same amount of time: Enter a time period in the After text box and click the All Slides button. Each slide for a different amount of time: One by one, select each slide and enter a time period in the After text box. Rehearsing the presentation: Rehearse the presentation and save the timings. Be sure to save the slide timings after you’re finished rehearsing. In Slide Sorter view, you can see how long each slide will stay onscreen. 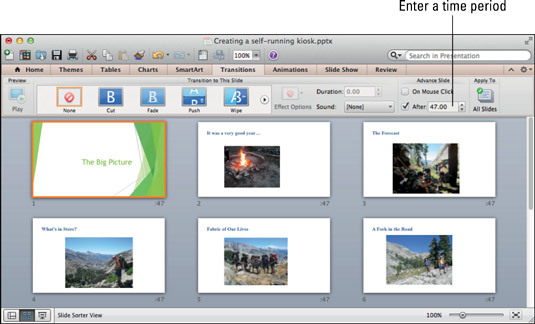 Before you can “self‐run” a presentation, you have to tell PowerPoint that you want it to do that. Self‐running presentations don’t have the control buttons in the lower‐left corner. You can’t click the screen or press a key to move forward or backward to the next or previous slide. The only control you have over a self‐running presentation is to press the Esc key (pressing Esc ends the presentation). Go to the Slide Show tab. Click the Set Up Show button. You see the Set Up Show dialog box. Under Show Type, choose the Browsed at a Kiosk (Full Screen) option. When you select this option, PowerPoint automatically selects the Loop Continuously Until ‘Esc’ check box. Make sure that the Using Timings, If Present option button is selected.